Your patients rely on their devices. But the same technology that enhances their lives can put a strain on their eyes. Now you can provide them the ability to work, play, and connect with the confidence that they’re reducing their exposure to blue light associated with digital eye strain. TechShield Blue is a next-generation anti-reflective coating that reduces blue light exposure. Simply put, it helps take the eye strain out of screen time. "VSP optometrists report seeing a 50% increase in digital eye strain due to blue light exposure." TechShield Blue simplifies your choice in AR coatings. If you’re going to recommend an AR, why wouldn’t you choose one that includes the added benefits of blue light reduction? Appearance matters. TechShield Blue was designed with this in mind. Featuring an attractive, near-clear appearance, this advanced coating overcomes patient resistance to colored blue light lenses. 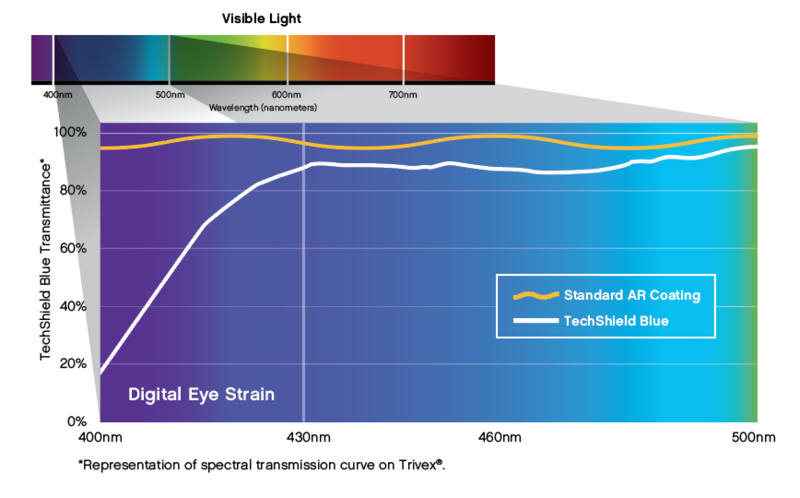 TechShield Blue absorbs and reflects blue light wavelengths associated with digital eye strain (400-430nm), reducing transmittances of these wavelengths by as much as 85%. Every time you help your patients reduce their blue light exposure with TechShield Blue on Unity Digital Lenses, you'll receive up to $12 in Unity Savings, 15 VSPOne Rewards points**, and progress towards your Unity target for the VSP Global® Premier Program. *Available on all materials and designs unless otherwise specified by the manufacturer. **Unity Savings and VSPOne Rewards amounts based on values for VSP Global Premier Program practice. TechShield Blue is a trademark of Plexus Optix, Inc.